PRESIDENT Edgar Lungu has said the death of former Health Minister Joseph Kasonde has robbed the nation of a true statesman who committed his life to the service of humankind and helping Zambia develop a resilient healthcare system. Mr Lungu said Dr Kasonde was a patriot who did not seek selfish interests, but dedicated his life to pursuing high professional standards and rendering quality service to the people with his medical skills. “He was a dedicated professional who served Zambia with distinction. We have gathered here to bid farewell to a very gallant son of the nation, a renowned doctor and politician,” the President said. He said this at the St Ignatius Church in Lusaka yesterday during a requiem service in honour of the late Dr Kasonde who was later buried at the Leopards Hill Memorial Park in Lusaka. 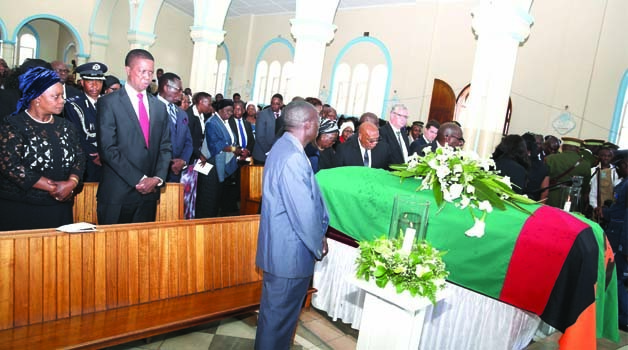 • PRESIDENT Edgar Lungu and First Lady Esther yesterday joined hundreds of mourners during the requiem mass held in honour of late former Health minister Joseph Kasonde at Saint Ignatius Catholic Church in Lusaka. The President said a lot of people in the health profession and outside benefited from Dr Kasonde’s commitment to service and attention to detail which distinguished his performance. Mr Lungu said Dr Kasonde had a positive impact on many people in health and in politics because of his sense of humour and his patience when handling people with opposing views. His selfless dedication towards work was evidenced from the various positions he served in, both in Zambia and on the international scene. Mr Lungu said Dr Kasonde, had a rare sense of commitment towards work, a quality which should be emulated by all serving medical practitioners. Health Minister Chitalu Chilufya described Dr Kasonde as a doctor, mentor and teacher who used his discipline to teach his associates best practices for the benefit of growth in the health sector. “He treated me not only as a brother, but as a colleague. He mentored, taught me many lessons and I enjoyed the close relationship I shared with him,” Dr Chilufya said. Mary Kasonde, in a send-off message which was read by Dorothy Kasanda, said Dr Kasonde was a gentleman and a supportive husband who had been able to adapt to different situations. “It will be hard for me to continue this journey alone. But I know God will always stay with me, rest in eternal peace,” Ms Kasonde said. In his homily, St Ignasius Parish Priest Charles Chilinda said the death of Dr Kasonde was an opportunity for mourners to reflect on the purpose of life and to realise their existence on earth was for a period of time only. He said despite his impeccable academic achievements, Dr Kasonde was a likeable, unassuming person, an attribute that drew many people to him. Max Sichula in delivering a eulogy said Dr Kasonde’s trademark was professionalism and everything he touched was characterised by commitment and professionalism. The service was attended by Patriotic Front (PF) secretary general Davies Mwila, First Republican President Kenneth Kaunda, First Lady Esther Lungu, Cabinet Ministers, Government officials. Others were former First ladies, relatives and friends from different walks of life.